This item is out-of-print, and here for historical purposes. Ambient collectors have searched for the missing link for years – a search for the albums that reflect the transition from vidnaObmana’s early minimalist-ambient work to his current tribal-ambient sound. Echoing Delight, Parallel Flaming & The Spiritual Bonding — out of print for most of the 90s — are that missing link. This is the Subterranean Collective. 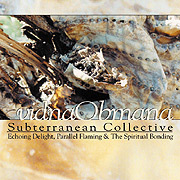 Subterranean Collective is vidnaObmana’s personal collection of these classic albums, presented as a special re-packaged 2-CD set. With re-recorded portions and extra layers of drones and ambience, Subterranean Collective displays vidna’s fusion of pure minimal and repetitive atmospheres with ethnic-influenced soundworlds. Includes Vidna’s first journey to the Sonoran desert to work with Steve Roach in the Timeroom. Lush, sensual electronics wash over a lattice of ethnic percussion and field recordings of night creatures, invoking a mood of supernatural presence and ritual atmosphere. At once soothing, hypnotic, and darkly provocative, vidnaObmana fulfills the promise of Brian Eno and Jon Hassell’s proposed polycultural ‘Fourth World Music’ of the early eighties. — The New Review of Records’ review of Parallel Flaming.